CRIME and public safety (20%) are a high priority in the upcoming municipal elections for those residing in Surrey, according to the latest Insights West poll. In sharp contrast, crime and public safety are a concern for ONLY FOUR PER CENT of residents in Vancouver and ONLY SIX PER CENT of residents in Burnaby – and ONLY FIVE PER CENT for residents in the rest of Metro Vancouver. 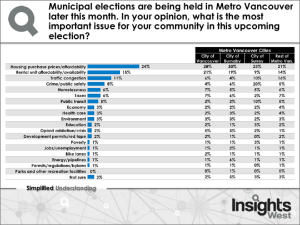 Voter sentiment is restless as almost seven-in-ten Metro Vancouver residents (69%) agree that it is time for a change of government in their municipalities. Those that most strongly agree with this statement reside in SURREY (80%) and VANCOUVER (78%) where there is no incumbent mayoral candidate. Housing is a key issue in this year’s municipal elections. Housing affordability is seen as the most important issue facing Metro Vancouver communities by a large margin relative to other issues (24%), followed by rental availability (15%). All other issues, such as traffic congestion (11%), crime and public safety (8%), homelessness (6%), taxes (also 6%) and public transit (5%) rank much further down on the list of priorities. Although housing affordability ranks the highest across all of Greater Vancouver, it is of greatest importance for Burnaby (30%) and Vancouver (28%) residents. Rental availability is a fairly close second for those in Vancouver and Burnaby (21% and 19%, respectively). Metro Vancouver residents located outside of these three areas cite traffic congestion (16%) as a significant concern in their communities and will likely be looking at how candidates propose to tackle this issue when making their selections. 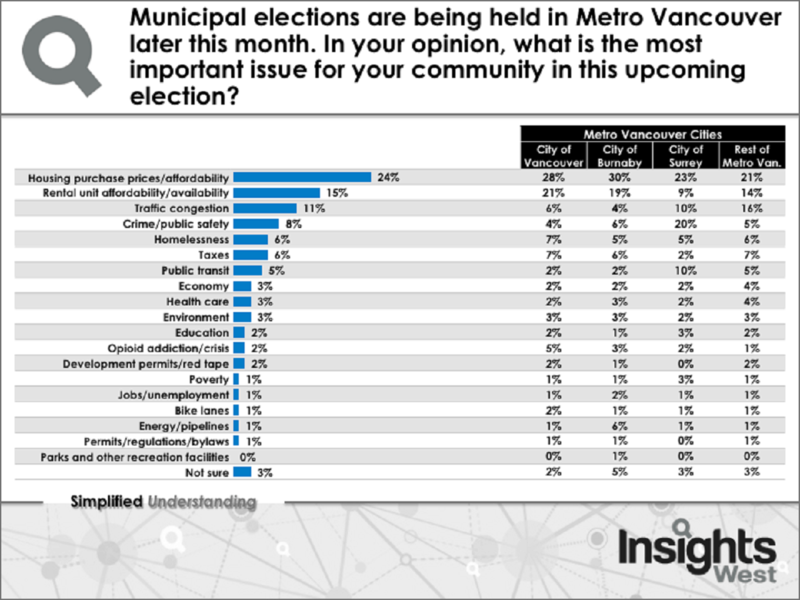 In the online survey of a representative sample of 1,000 Metro Vancouver adults, 70% say they are “very likely” to vote in the upcoming municipal elections but, despite this enthusiasm, only one-in-five (22%) likely voters have decided which candidates they are going to vote for. While the remainder are largely planning to do more research before deciding (68%), a handful are either forgoing further research (8%), are making a random selection (1%) or admit they are not sure (1%).